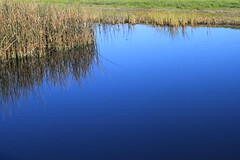 Dr. Lisamarie Windham-Myers is an ecosystem ecologist specializing in wetlands. As an ecosystems ecologist, she works across a broad spectrum of wetland types on issues related to carbon, nutrient, and mercury cycling. 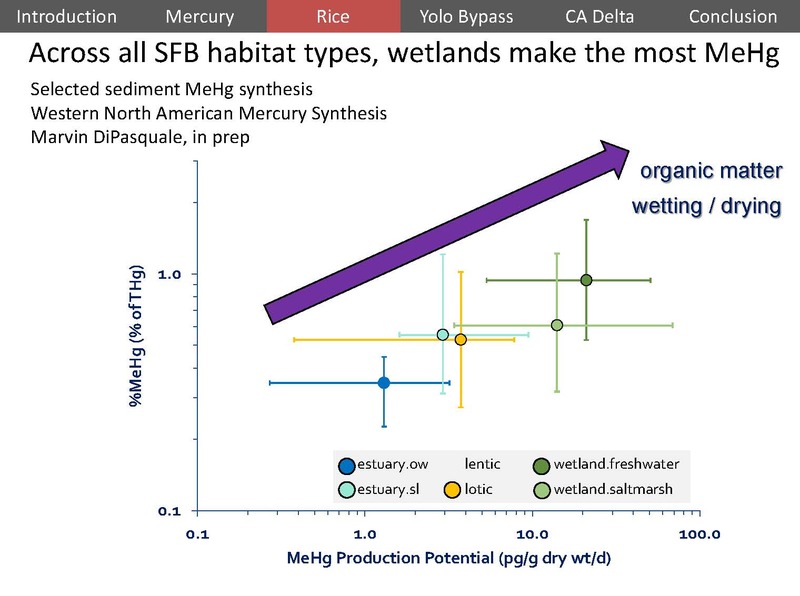 While her focus on mercury began in New Jersey meadowlands, Lisa is an active researcher in the biogeochemistry on all U.S. coasts, and for the past 12 years, she has played a leading role in providing science advice to agencies seeking to reduce methylmercury exposure in the San Francisco Bay. 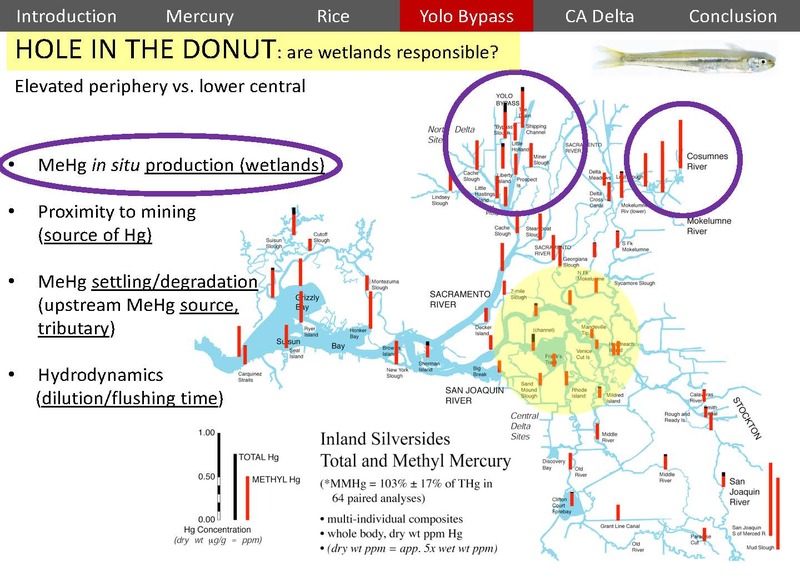 In this presentation, she discusses mercury and rice in the California Delta. 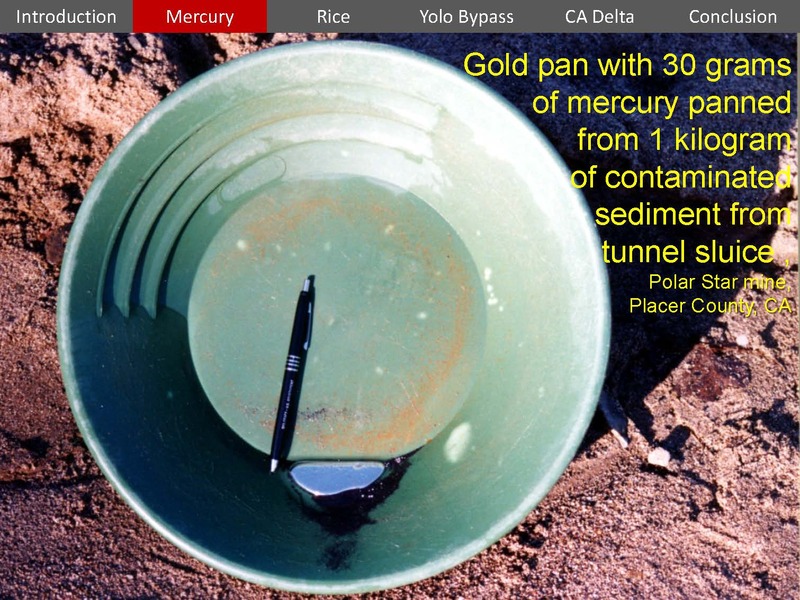 “When we talk about mercury, most people think of it as a local San Francisco Bay story because we have a lot of contamination, but it’s really a global pollutant,” she said. In 2013, 128 signatories signed the Minamata Convention to reduce their emissions of mercury. While mercury has never been shown to have a biological purpose, it’s used in all sorts of things, such as light bulbs, switches, batteries, and thermometers. 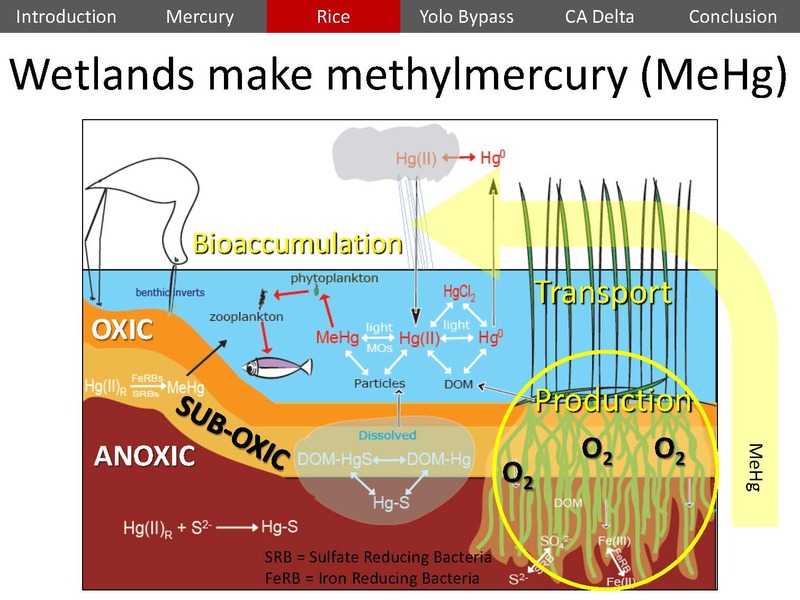 Dr. Windham-Myers said that because mercury has a really low boiling point, it can be in a vapor form in the environment; that is why emissions are a concern. 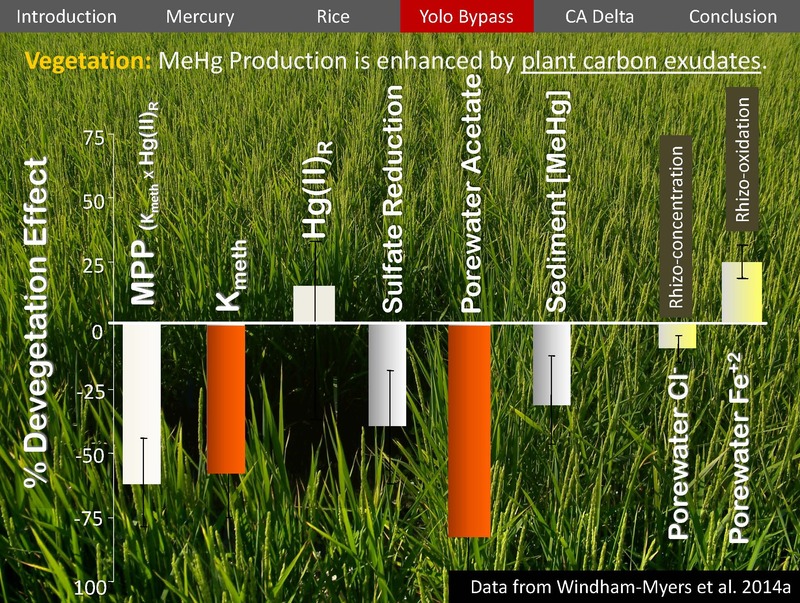 Emissions turn mercury into a nonpoint source. Hg-zero, which is elemental mercury; this form is fairly inert. It goes up into the atmosphere, stays there for a while, and makes the way up to the poles – that is how it is getting into the polar bears. This form is capable of long-distances and being transported globally. Mercury 2-plus, or divalent (sometimes called reactive mercury) is basically a sticky gas. When mercury gets oxidized, it can glom onto raindrops, particles, or aerosols and it can deposit out from the atmosphere, so it has a less long-distance transport. Particulate mercury is released in smoke, such as from a coal-burning power plant. It has a short transport; it’s basically gravity. It’s going to move until it falls out of the sky. The mercury ore in the Coast Range is mostly cinnabar, or mercuric sulfide. It is really stable. In order to get the mercury out of the ore, you have to roast it a high temperature to volatize the mercury out of the ore. Once it has been volatized, it can be condensed into quicksilver or elemental mercury, bottled and taken wherever it needs to go. It’s going to take a long time – far longer than 100 years – for it all to get flushed out to the ocean, and it would be very disruptive to try to dig it out, so it’s basically there, she added. 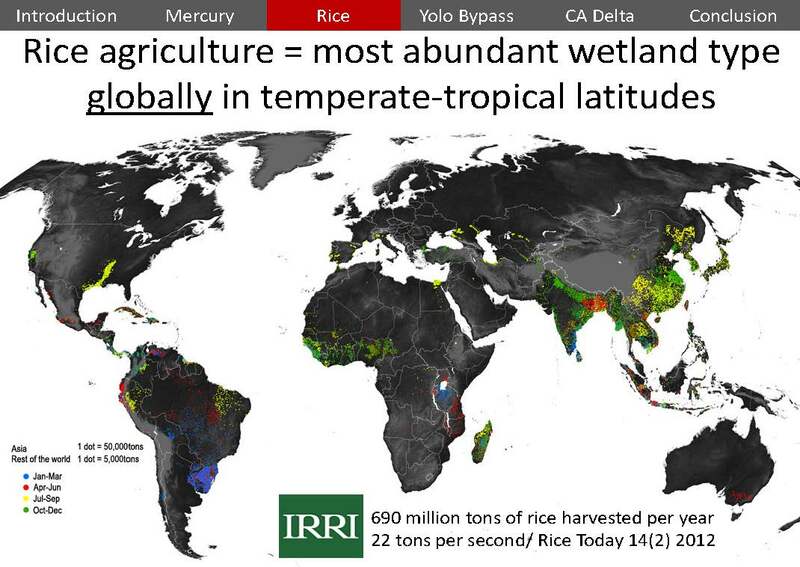 From a global perspective, rice fields are the most abundant type of wetland in temperate and tropical latitudes. 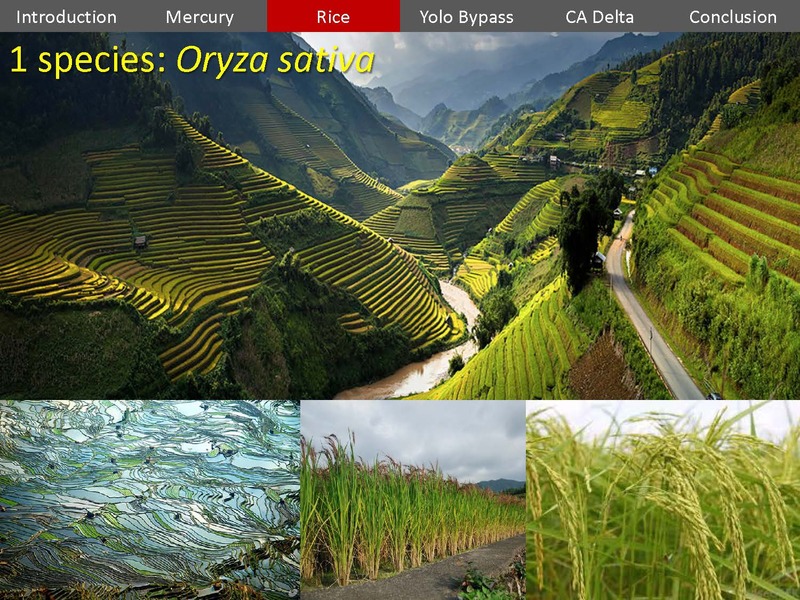 All rice fields have Oryza sativa; for the last 4,000 years, they have bred Oryza sativa to grow white rice, black rice, red rice, long-grain, aromatic, short-grain, medium, or otherwise. 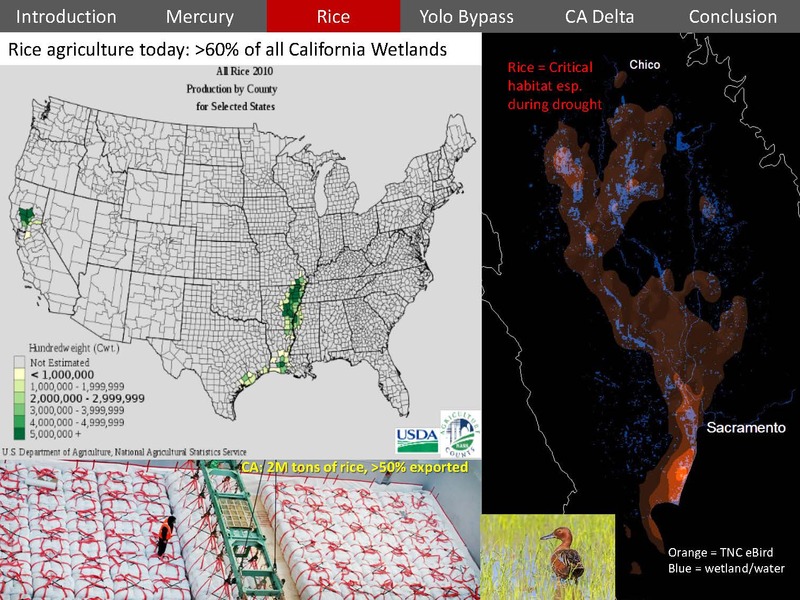 In California, rice is harvested in October; the Mississippi Valley harvests around September. In the U.S., there is just one crop a year. 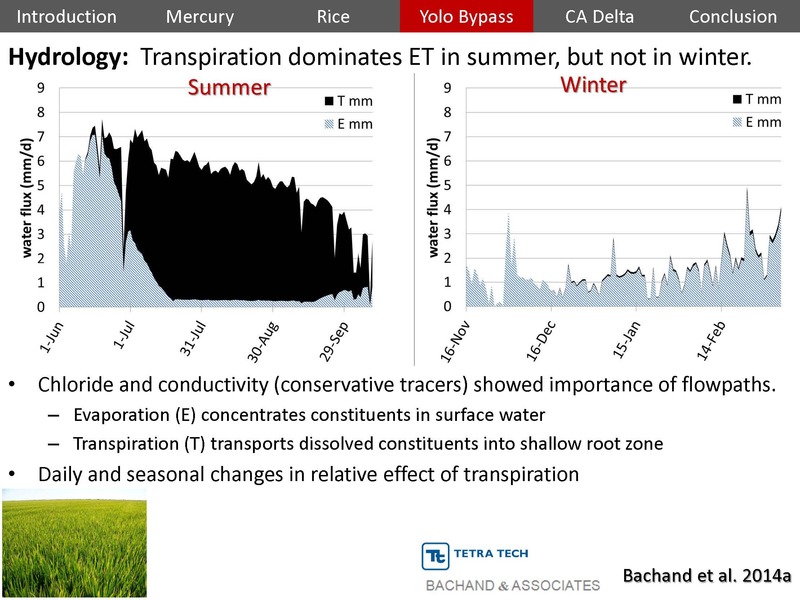 But in tropical wetlands, they can have up to three crops per year; it only takes about 30 to 60 days to grow a crop; then they pull it out and then put the next one in. So a lot of rice is grown around the world, and it’s a very important food source. 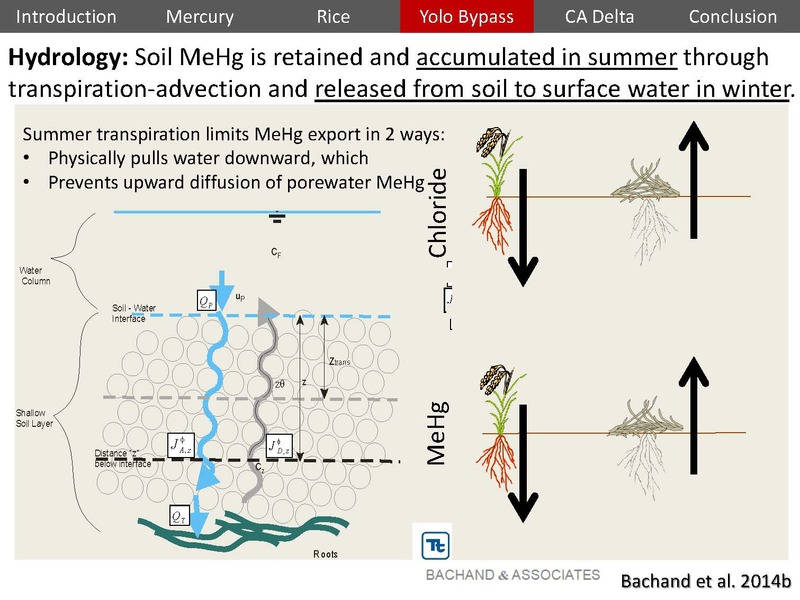 For methylmercury to be a problem, it’s not just the production of it, but it leaves the soil, enters the water column, and ultimately the food chain. 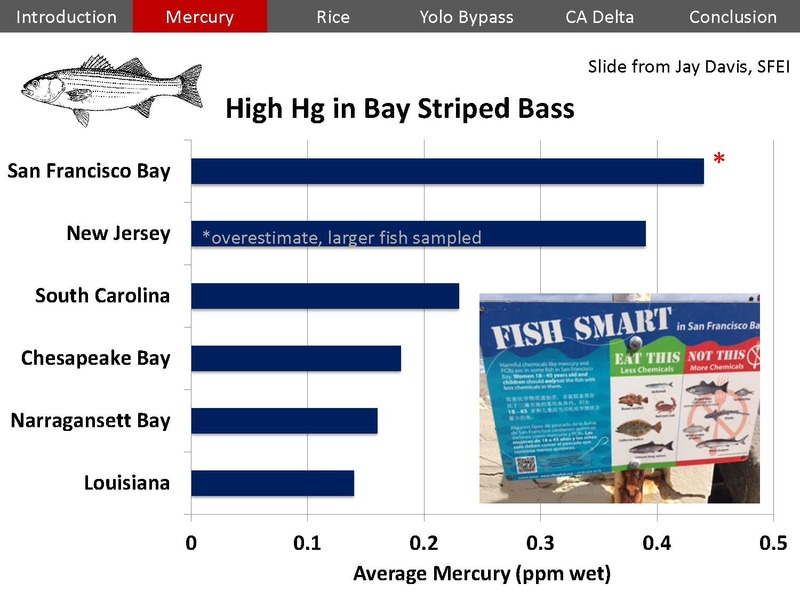 Methylmercury is bioaccumulative pollutant which concentrates as it moves up the food chain, from algae to zooplankton to prey fish and the predators that eat them, such as trout and bass. “So the mercury just keeps getting more and more locked into tissues as it moves up the food chain, and it’s hard to get rid of once you have it in your system,” she said. This is becoming in issue, particularly in China, because they grow a lot of rice as well as do a lot of coal combustion and other mining practices, and rice is a main staple of the country’s diet. 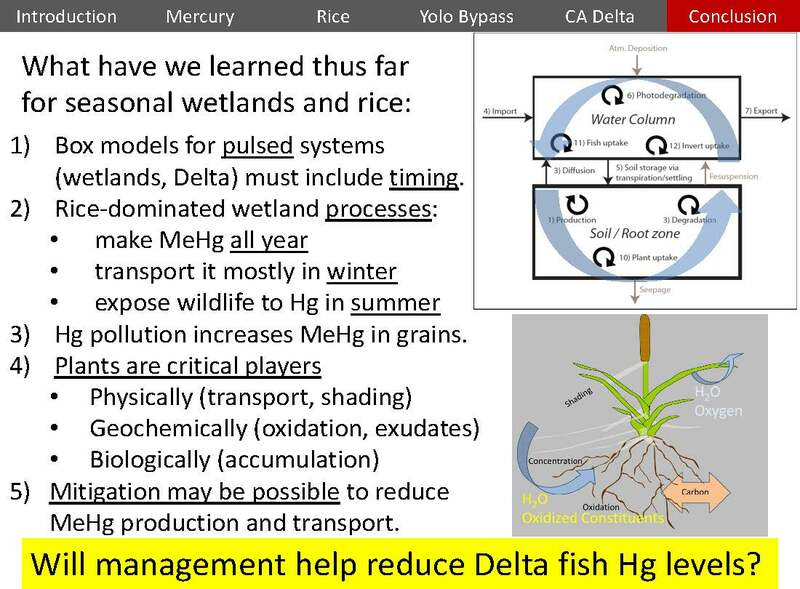 The dominant way that some populations in China are picking up methylmercury is through their rice consumption, not their fish consumption, she said. Most of the research is being done in China as they are trying to come up with a solution. 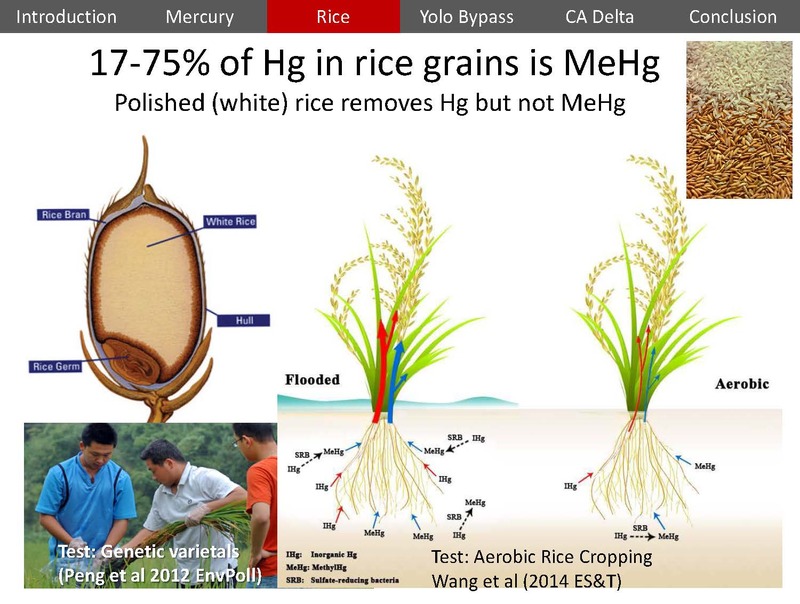 One potential solution is genetic varietals that don’t move the methylmercury so quickly; another is the idea of aerobic rice cropping or basically keeping the soil not so wet so not to stimulate methylmercury production and that it doesn’t move up into the plant grain itself. 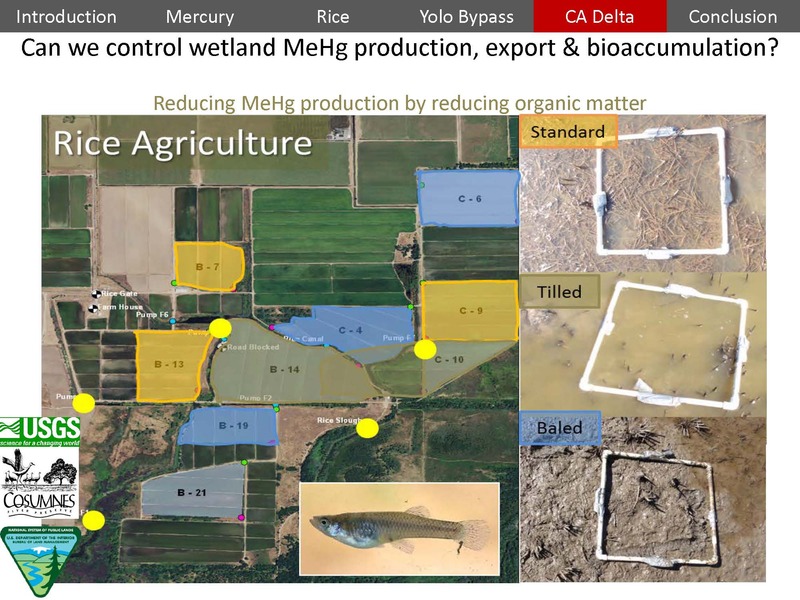 One might think the wetlands are responsible because that’s where the methylmercury is being made, but that is only one of four possible explanations. 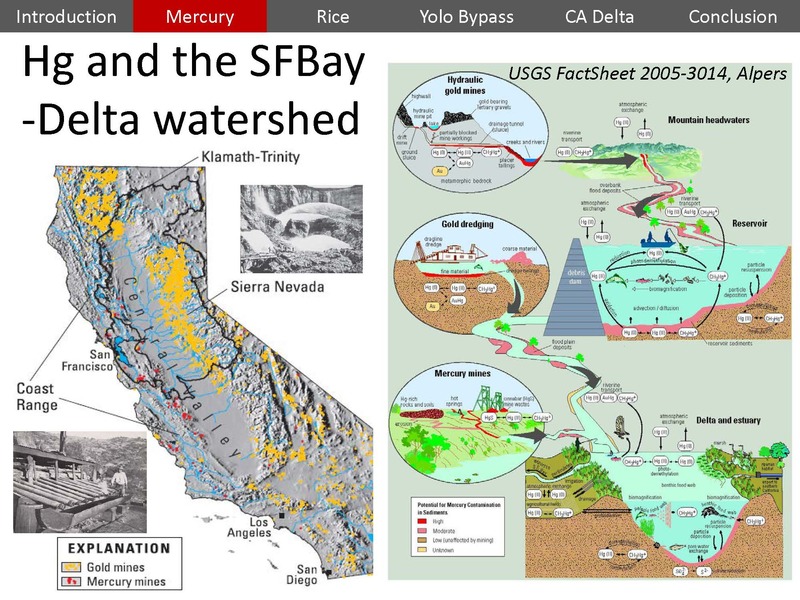 The second possibility is simply proximity to mining, and more mercury from the tributaries coming in from the Sierra and the Coast Range then the San Joaquin. 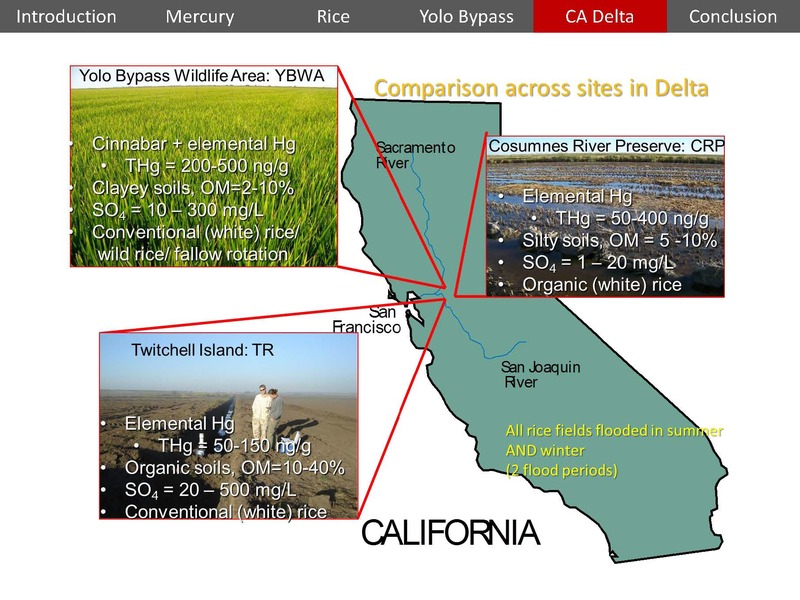 The third possibility is that the water comes in through these tributaries already has methylmercury and by the time it gets into the Delta and the more open-water type environments, the particles settle out and the mercury drops to the bottom, or it gets degraded by exposure to sunlight. 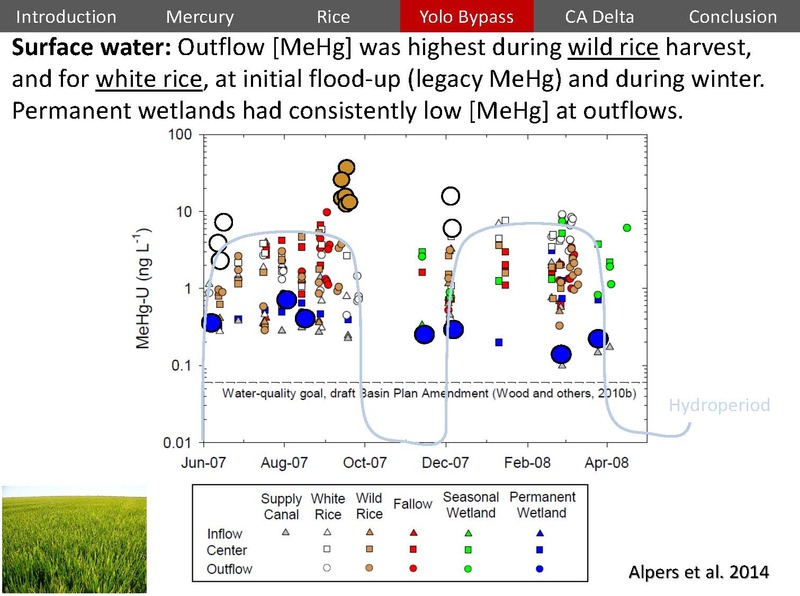 The fourth possible explanation is just pure hydrodynamics; that the Central Delta is a really well-flushed system. The water comes in, and it gets cleaned out through the tidal system. 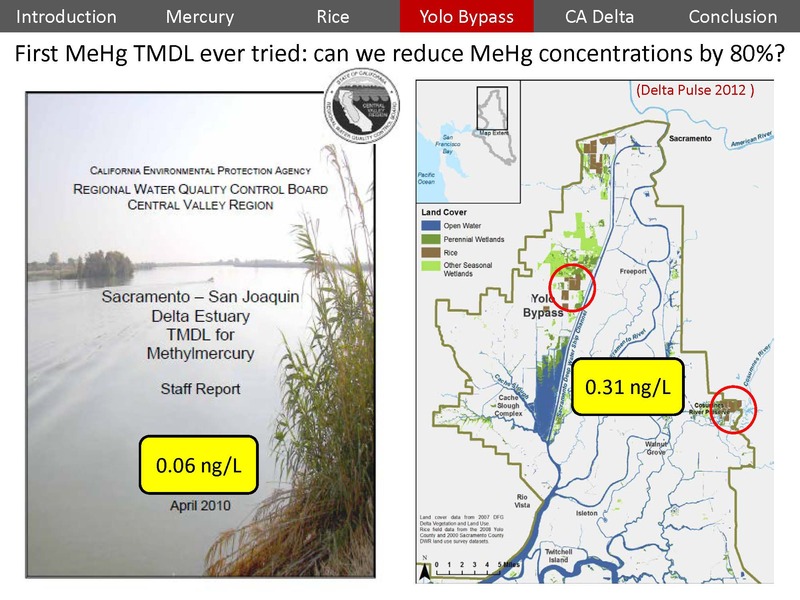 The TMDL is trying to get from an average of 0.31 nanograms per liter in the Yolo Bypass down to 0.06, an 80% reduction. “I’m not sure if we’re going to get there, but that’s the goal,” she said. She noted that this level of accumulation in fish is well above the FDA guidelines of a fish that you should eat. “These are little tiny mosquito fish, so they are at the base of the food web. Anything eating them is just going to get more and more mercury in them,” she said. 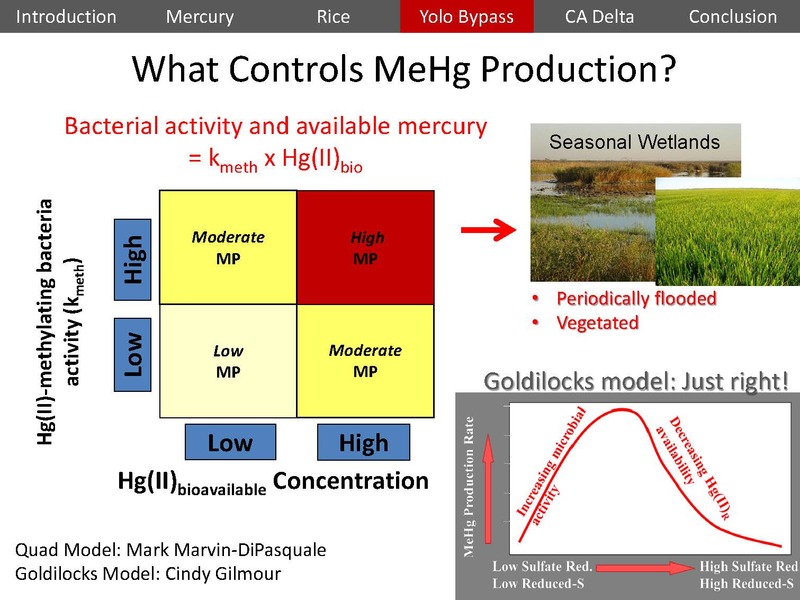 It’s often called a ‘Goldilocks’ model – it’s the idea that there’s this just-right condition; that when it is in this zone, there is high methylmercury production. 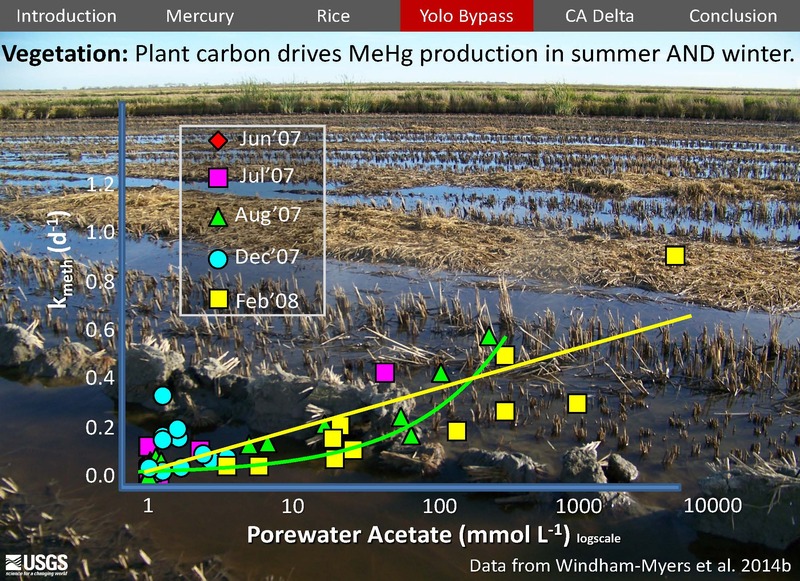 When there is lower rates of sulfate reduction or more sulfide in the soil, there is less methylmercury production because the teeter-totter is pushing on one direction or another, she said. She clarified that the numbers were not low compared to other places in the country, but for the Delta, they were lower than they expected. What explains these differences that they saw through time? 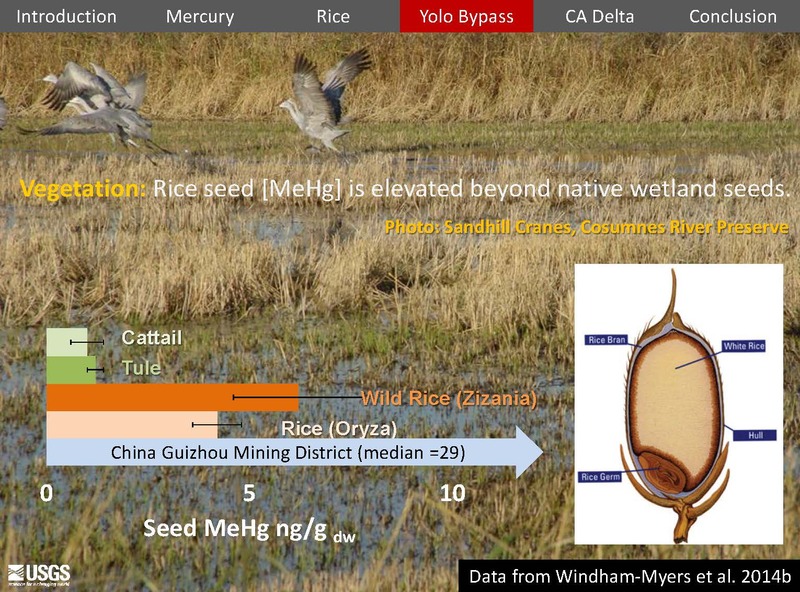 They also looked at the actual concentrations in the seeds to see what it was from a wildlife perspective; are they picking up a lot of mercury by eating these rice and wild rice grains? 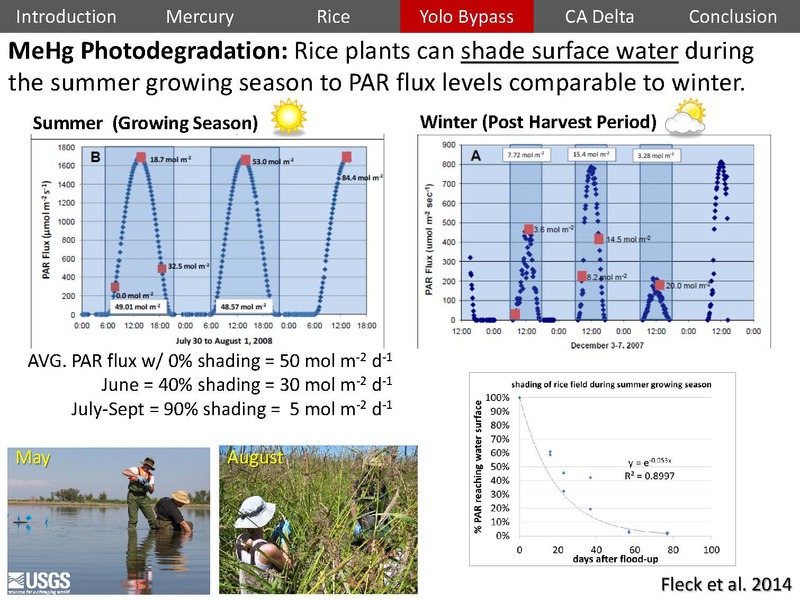 They have done some studies in the Cosumnes River Preserve and on Twitchell Island, both places where they’re growing rice. It’s great that they know the general patterns, and understand when export is coming and not coming, but it doesn’t really get us to the point of fixing it, Dr. Windham-Myers said. 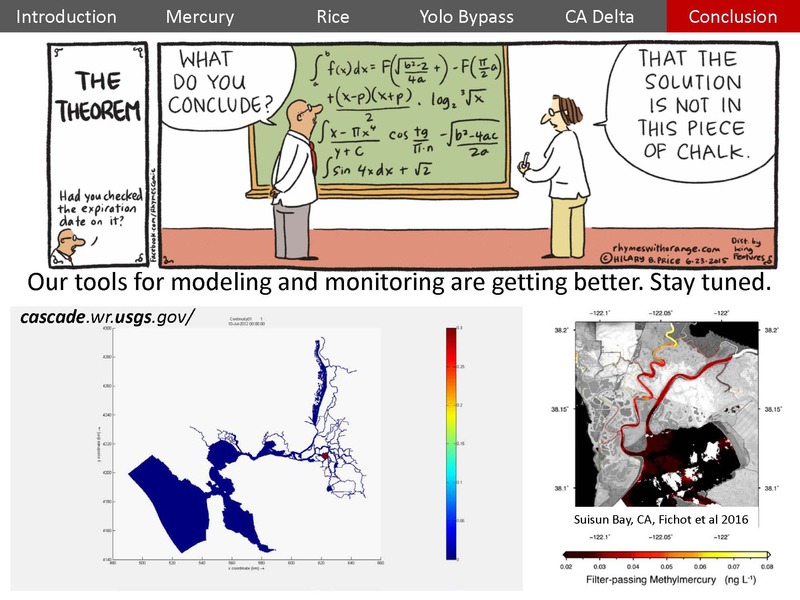 She then showed a visualization from the CASCADE model, which stands for Computational Assessments of Scenarios of Change for the Delta Ecosystem. 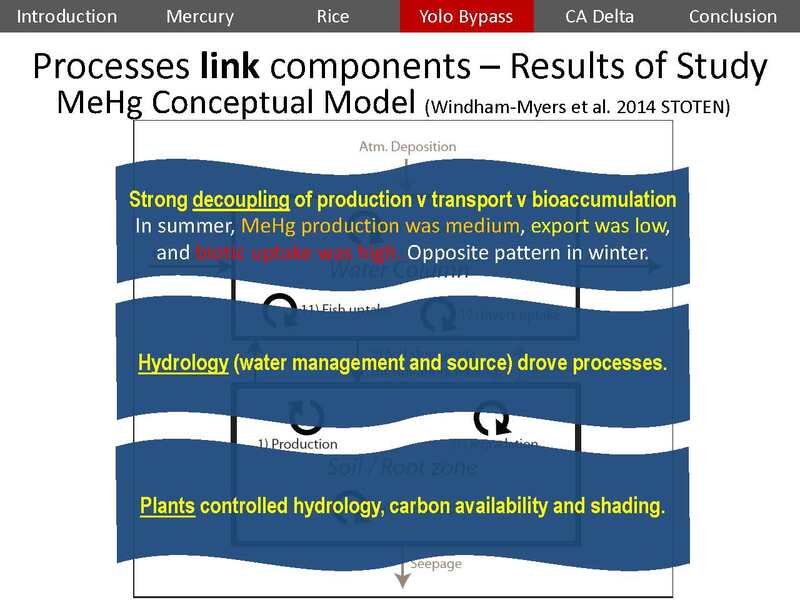 She said it’s a great model that lets you link a lot of processes together. 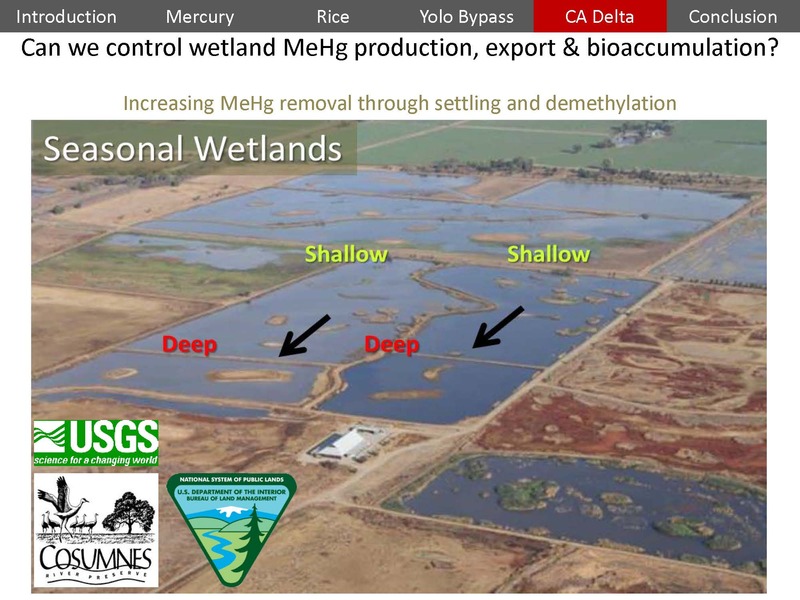 The visualization was of the physical transport model, to show how methylmercury might move around in Franks Tract, a Delta island that flooded about 30 years ago; it was never reclaimed so it’s now a big lake in the Central Delta. 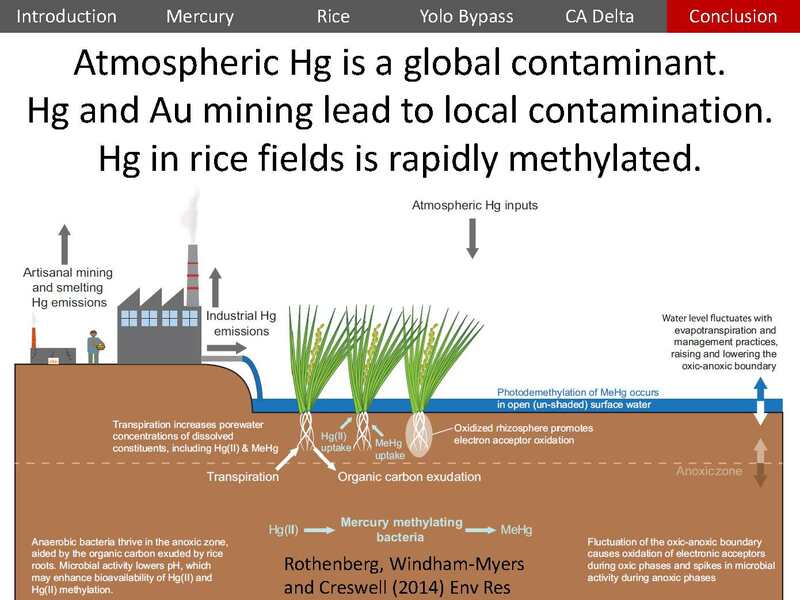 The model shows where the methylmercury might move if it was in there and wasn’t going through any processes. WHAT ABOUT THE RICE THAT MIGHT BE ON YOUR DINNER PLATE? 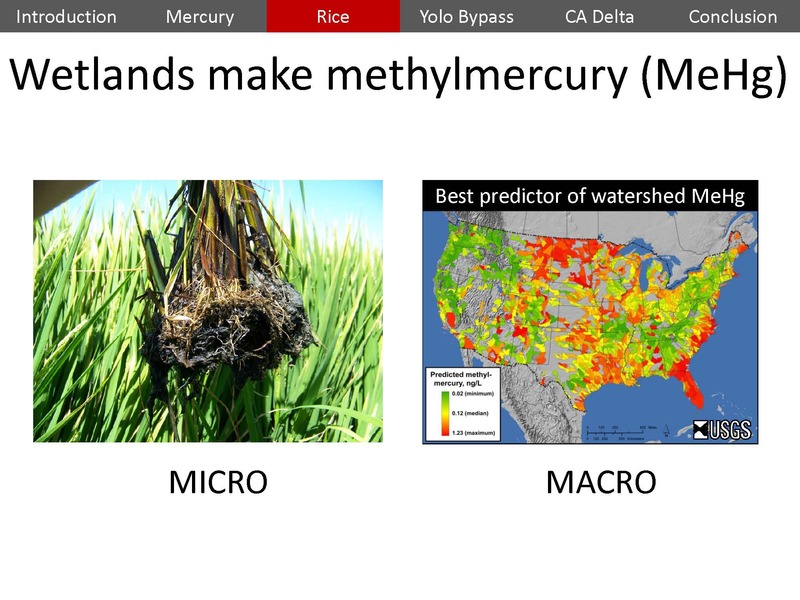 QUESTION: Mercury is evil, but there are all sorts of other nasty stuff associated with agriculture. 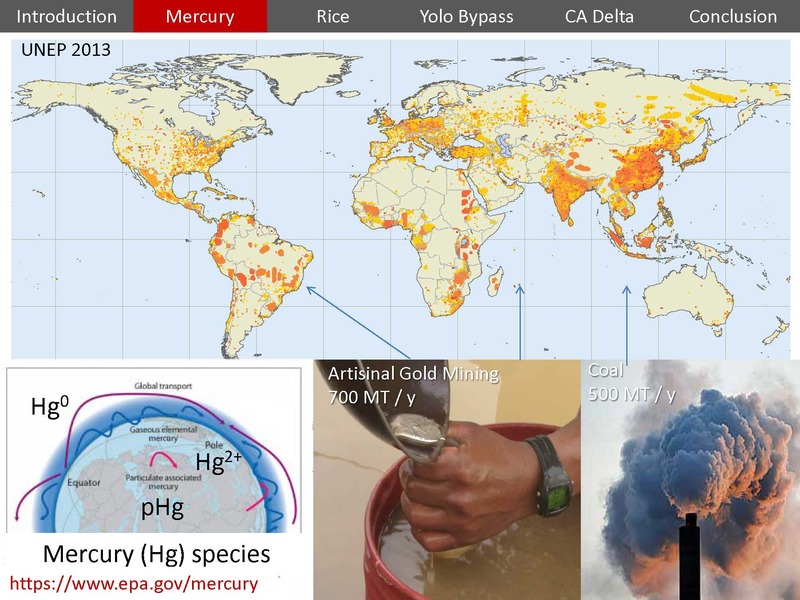 Where does mercury fit on the sort of scale of competing with the other stuff for evil-ness? 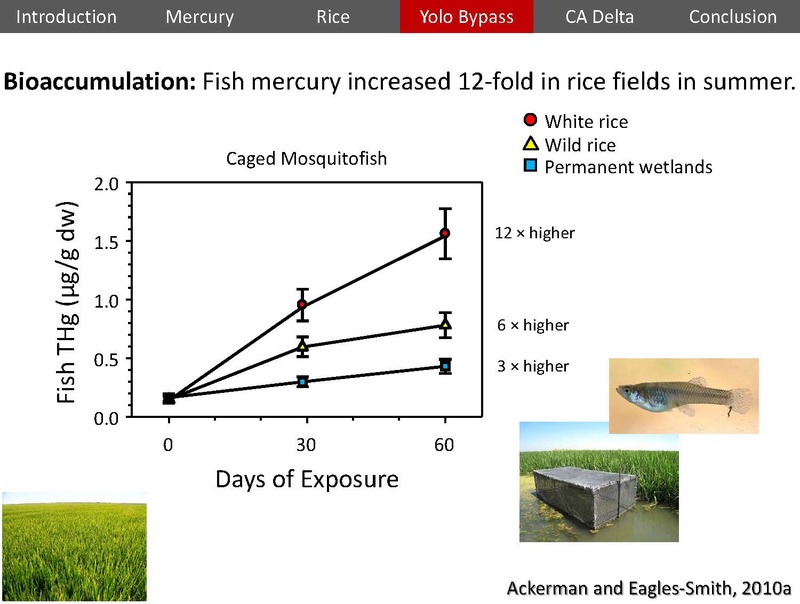 QUESTION: Did the rice people use a lot of insecticide or … ? QUESTION: What’s the original source of concentration in coal, to begin with? And second, do we see any pattern geographically or in geological time in coal deposits? Do they differ wildly? Is Paleozoic coal worse than Mesozoic coal or such? To watch this presentation, click here.